The UIDAI provides several facilities online for Aadhaar holders. However, changing the mobile number requires the person to visit an Aadhaar centre. 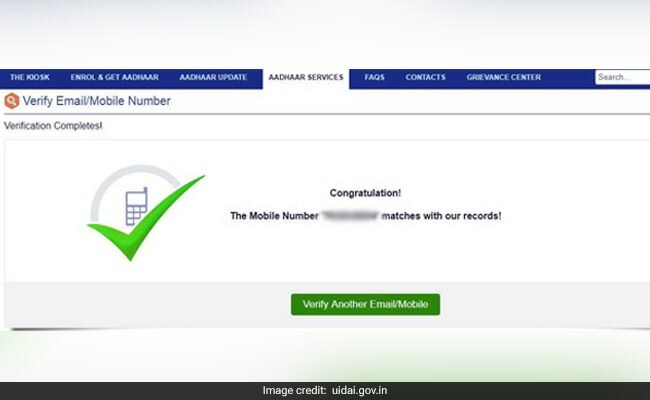 Do you need to update the mobile number registered with Aadhaar? For this, you have to visit an Aadhaar centre. 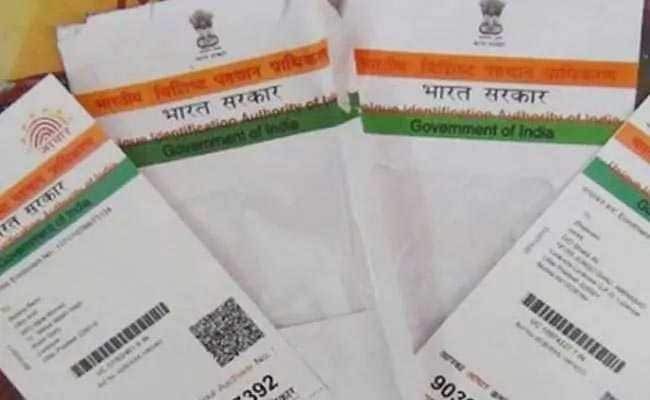 The UIDAI or Unique Identification Authority of India, which issues both Aadhaar number and Aadhaar card to the general public, provides several facilities online for those who own an Aadhaar card or have applied for it and are waiting for one. These range from one that helps a user retrieve a lost Aadhaar number to one that verifies the mobile number registered with Aadhaar. However, changing the mobile number registered with the Aadhaar system requires biometric authentication by the person and that's why the user has to visit an Aadhaar centre - either an independent Aadhaar centre or one located in either a bank or a post office - in person. This was said in a series of posts by the UIDAI on microblogging site Twitter. Aadhaar update by post service is no longer available. The Aadhaar holder needs to visit any nearby Aadhaar Kendra and add/update mobile number with biometric authentication. Mobile based OTP authentication is a powerful tool. It is important that the resident gives biometric authentication for mobile number updation. Hence the visit to enrolment center is a must. 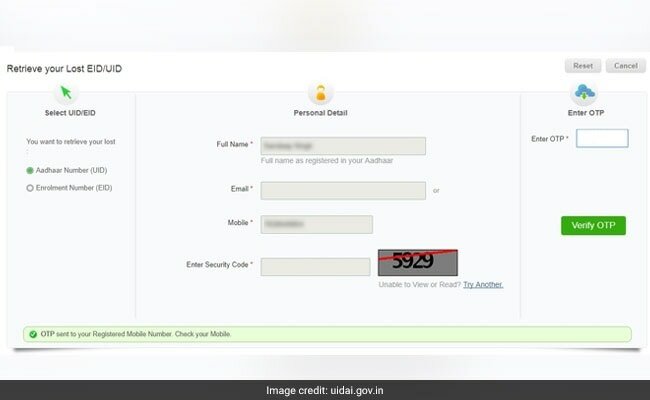 A user can verify the mobile number of email registered with the Aadhaar system online through the UIDAI portal - uidai.gov.in. This tool can be accessed by clicking on the ‘Verify Email/Mobile Number’ link on the UIDAI portal’s homepage. 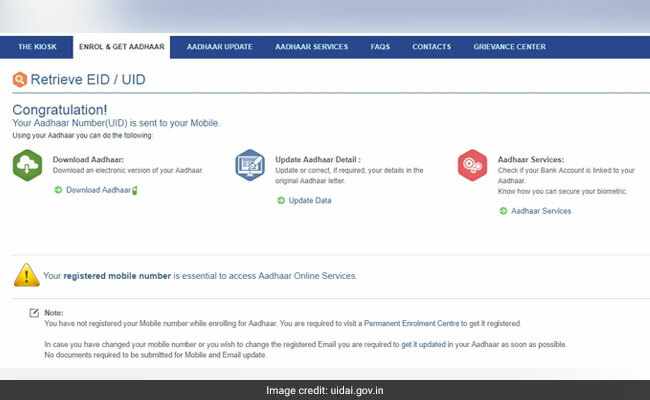 On the next page, the user is required to enter details such as Aadhaar number along with either the mobile number or email address he or she wants to verify. After filling in the required details, the user has to click on ‘Get OTP’ (one-time passcode) to proceed. Once that is done, the user shortly receives the OTP on the mobile number registered with the given Aadhaar number. If the mobile number entered is the same as one registered with Aadhaar, the system confirms so on the next page. Click on the ‘Locate Enrolment & Update Centres’ link on the UIDAI homepage. This leads to another page, wherein the user is presented with a variety of options to select the desired search preferences. The user can choose from options such as state, pin code and district as per his or her preference. After providing the required inputs, the user may proceed by clicking on 'Search'. Subsequently, the UIDAI search tool displays details on Aadhaar centres. 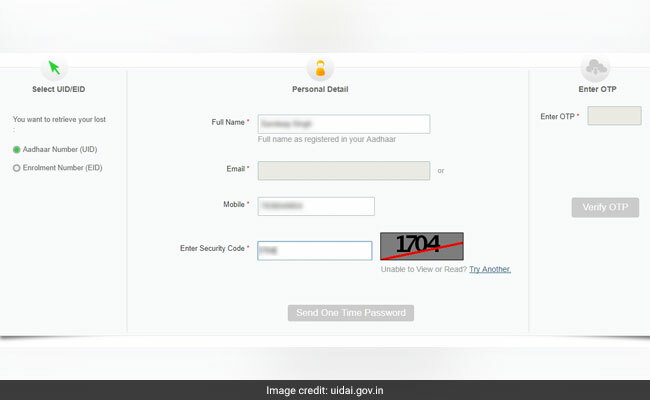 A UIDAI tool that enables a user to retrieve an Aadhaar number or Enrolment ID (EID) can be accessed by clicking on 'Retrieve Lost UID/EID' from the homepage of the portal. On the next page, the user is required to make a choice between Aadhaar Number and Enrolment Number, depending on the desired feature. After selecting the required option, fill in details such as name and mobile number in the given fields, and click on 'Send OTP'. Once this is done, the user receives the OTP on his or her registered mobile number shortly. The user is required to fill in this OTP in the specified field to the right and click on 'Verify OTP'. After this step, the UIDAI portal sends the Aadhaar number in a text message to the registered mobile number. A similar process can be followed to retrieve an EID after selecting the respective option at the beginning of the process.